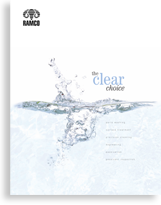 The MKT16 is a compact wash/rinse/dry console designed to provide a complete aqueous cleaning system using minimal floorspace. The basic system includes washing, rinsing and hot air knife blowoff drying stages. Each stage can accept loads up to 50 pounds and baskets up to 14″L x 19″W x 15″H. The Case History shows an MKT16 designed for precision cleaning of machined components using ultrasonics with cascading turbo/filtration. The system includes dual cascading digital cycle timers, temperature controllers, solution low level safety, turbo/filter systems for both wash and rinse stages, OR6-CVS oil removal system with SurfaceSweep, and stack lights. The customer required custom exterior paint to match existing equipment in their factory. 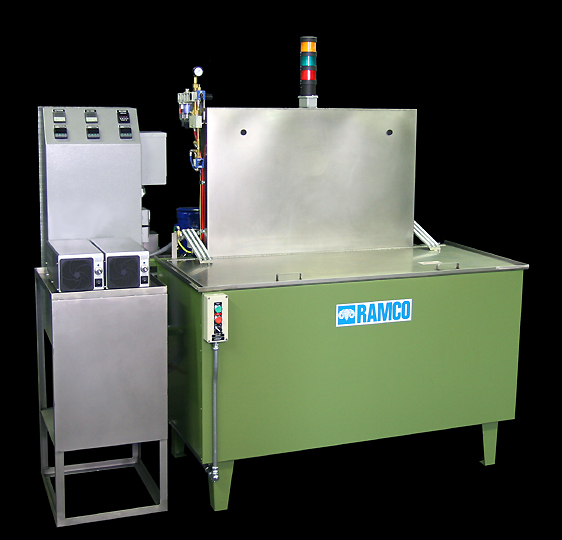 RAMCO Equipment MKT16 compact aqueous cleaning system using minimal floorspace. The layout is unlike conventional consoles. Nothing is placed underneath processing tanks or tucked behind “access” panels. All valves, pumps, filters, cylinders and heaters are located outside of the console where they are accessible, clearly visible for inspection and easily serviced. This comprehensive system provides a very high level of cleanliness in a rugged industrial console built for production.